When you advertise with Word&Way, you promote your goods, services, needs or events to our readers and their friends. Our goal is to help you best utilize the advertising dollars you invest with us to promote your message. 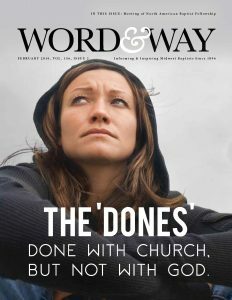 Download a sample issue of Word&Way. 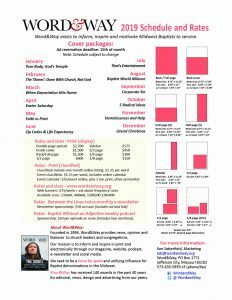 Click here to see our rate card and editorial calendar. – Advertise regionally in print! Can’t wait until the beginning of the month? Ask us how you can start running your ad today! The Word&Way site offers banner and box web advertisements, based on size and duration. “Baptist Without an Adjective” is Word&Way’s weekly podcast (with occasional bonus episodes), featuring interviews with national and global Baptists, faith leaders, and news analysis. A $10 sponsorship includes a custom message at the beginning and middle of an episode. Contact us today and discover an option that fits your needs and budget.